While volunteering at Project HOME’s 1515 Fairmount residence, YouthBuild student Dominique had an idea: What if the organization gave out awards recognizing the residents for their growth and resiliency? Project HOME empowers people to break the cycle of homelessness through housing and services, and the 1515 Fairmount residence is home to men and women in recovery after struggling with mental illness. As someone who had experienced setbacks in her own life, Dominique recognized her own struggle in the struggles of the residents. She wanted to support them, and she knew that their continual efforts to overcome personal challenges deserved recognition. Dominique’s idea was inspired by the R.E.P. days that we have at the end of each session at YouthBuild. R.E.P. days include presentations of what students have learned, and awards for students recognizing their high attendance and embodiment of YouthBuild’s core values (Respect, Excellence, and Perseverance). Dominique remembered how encouraged and inspired she was when she received her first R.E.P. day award. So she suggested the idea of an awards ceremony to the Volunteer Coordinator at Project HOME. After two weeks of preparation, YouthBuild Philly and Project HOME staff joined Dominique and the 1515 Fairmount residents on July 19 for a moving and inspiring awards ceremony. Project HOME staff created the awards for each resident, recognizing them for their growth and resiliency, as well as their learning accomplishments and service contributions. motivated me because of the trials and tribulations you have overcome. In my school, this is known as perseverance. Perseverance is a continued effort to do or achieve something despite difficulties, failures, or opposition. I am here today for this reason. I feel that if anyone should get a chance of being celebrated it should be strong and courageous people like you. I hope this is a moment that you all cherish. Today is a huge day for me because I get to give awards to well deserving people. I am so grateful that I get to see what not giving up looks like. Each of you have an amazing story to tell and a gift that can impact the world. I just want to say, don’t give up. I truly believe that I am standing in front of people who got knocked down, but got up by any means and made a complete transformation. That to me shows true dignity. Today we’re here to celebrate you as individuals, but I am a firm believer in friendships and you have all gone through this process and succeeded together so don’t forget to keep these friendships and let them blossom. I want to thank Project HOME for allowing us in their space and being so generous and really caring about the lives they come in contact with. Also, I want to thank YouthBuild for the encouragement and resources to pursue the thing I am passionate about. Students showed initiative in planning and implementing service projects around the city, including an awards ceremony for Project HOME residents. 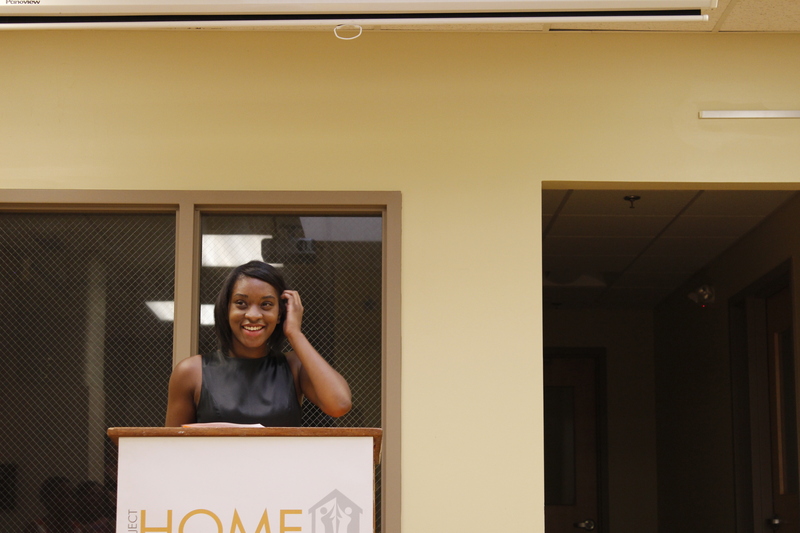 We applaud the residents for the huge changes that they have made and are making in their lives, and thank Project HOME for everything that they do – including their support of Dominique’s idea! Dominique plans to pursue a career in social work, and we believe she has an exciting and successful career of helping others to look forward to. Next Post Celebrating the Page 2 Stage Vol.2 Book Launch!